Chic Vacation Style — . My goal while packing to my trip to the U.S. Virgin Islands included one aim: pack cute and casual outfits. I wanted easy breezy outfits, but I did not want to overlook style for comfort. I wanted both! As I packed, I focused on a few key things that would ensure that I would be comfortable AND stylish on my Caribbean vacation. Below are a few of the things I packed and a few outfits I wore. Cute flats are vacation staples for daytime exploration. I packed a few pairs in neutral colors to pair them with different outfits. Flowy Blouses - these are always great for dressing up shorts or jeans. Yes, t-shirts are cool, but a pretty silk or bohemian blouse always takes a comfortable look up a notch. I purchased the blouse I'm wearing in the photo below at Nordstrom Rack, which is one of my favorite stores for affordable quality pieces. You can find flowy blouses almost anywhere. I love this blouse by Mango and this bohemian inspired top is perfect for any vacation style outfit . Fun accessories - they’re usually easy to pack and the right ones can really make your outfit pop. 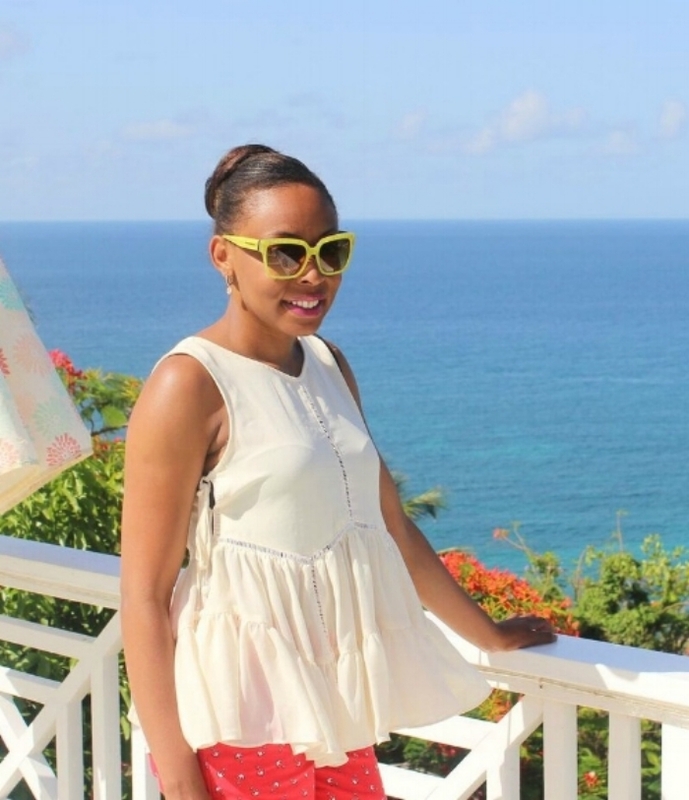 I wore my neon yellow rimmed sunglasses with almost every outfit during the day and loved it! Bright colors & fun prints. Perfect way to experiment and have fun with your style for a ropical vacation. Versatile outfits – On our Caribbean vacation, sometimes you hop straight from the beach to a beachside dinner, bring pieces that you can wear to both. Chic cover ups & sundresses are perfect for these times. This piece doubles as both a coverup and a dress. I found my high waisted floral pants below at the Zara summer sale. They're currently sold out, but check out a similar pair here. What do you usually pack for vacation? and how do you express your vacation style?